In her third full-length collection of poems, Jennifer Militello weaves fragmentary letters addressing illness and struggle through ventriloquisms of mythological heroes and dead composers, ancient goddesses and murdered girls. Stylized “dictionaries” open into lay-ered definitions meant like magical clothing or tutelary amulets to provide shelter from a world that cannot be controlled. As the poet stitches together a plethoric identity to ex-plore disguises, A Camouflage of Specimens and Garments casts a smokescreen of selves. Like wind, God eavesdropped in the doorway. His hybrid anatomy broken. His structured body loose. where once there were dozens of roses. As it rained, God’s every dry eye trembled. like what stands in for reason when reason is maimed. divided in the listening like a simple skein of wheat. predators sheltered in the henhouse of the heart. Jennifer Militello is also the author of Body Thesaurus, named one of 2013’s top ten poetry books by Best American Poetry, and Flinch of Song, winner of the Tupelo Press First Book Award. She has been awarded the Barbara Bradley Award from the New England Poetry Club, the Ruskin Art Club Poetry Award from Red Hen Press, and the 49th Parallel Award from Bellingham Review, as well as grants and fellowships from the New Hampshire State Council on the Arts, the Barbara Deming Memorial Fund, Writers at Work, and the Millay Colony for the Arts. 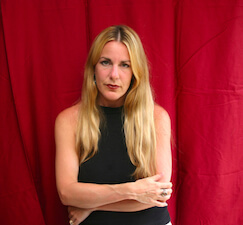 Militello teaches in the MFA program at New England College.